To generate a usage report that shows usage for each department, select Departments from the Group By field on the Usage page. For instructions, see Generating usage reports. To generate an audit report of actions performed by all of the users in a department, use the Department filter on the Auditing page. For instructions, see Generating audit reports. To generate an audit report of actions taken on departments (for example, Add User to a Department), use the Show Activity filter on the Auditing page. For a full list of department activities that can be audited, see Description of auditing activities. (Optional) Use the Search, Sort by, and Display options to change the list of departments displayed on the screen. The export report includes only the departments that are displayed. Save the file when prompted. 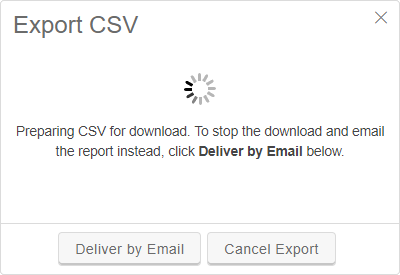 Or, if you need the full report but don’t want to wait for it to compile, click (Deliver by Email). The report is generated offline, and then a link to the report is emailed to the address associated with your user account. The report link expires after seven days. Department ID A unique identifier for this department. Name The display name of the department. Description The description for this department. Last Updated By The ID and username of the last person to make changes to this department. Storage usage (GB) The amount of storage used in the current month. Storage limit (GB) The amount of storage available to this department. SVM Hours usage The number of SVM hours used in the current month. SVM Hours limit The number of SVM hours available per month to this department. SVM usage The number of SVMs currently in use. SVM limit The number of SVMs a department is permitted to run concurrently. VM usage The number of VMs currently running. VM limit The number of VMs a department is permitted to run concurrently. Users The users who are members of this department.